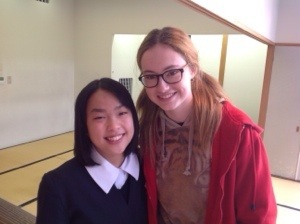 Today, after a lovely sleep in until 8am, my host sister Kanoko and I set off to Atomi Gakuen for our farewell party. 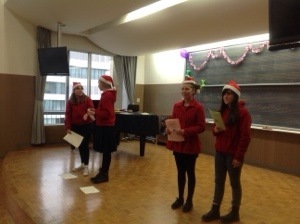 We arrived at 10.30 and started preparing for our performances by singing, playing instruments and page-turning. 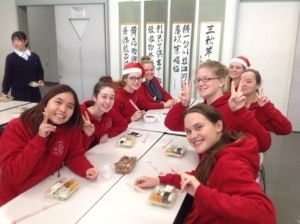 We had a short break for lunch, featuring rice balls, gyoza and many sweets, before returning to our rehearsals. At 2pm, our host families began to arrive and we seated ourselves at the front of the room to watch the show. 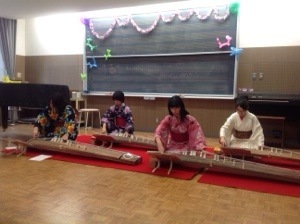 It started with a Japanese Harp Performance involving 4 girls, Aoi, Kana, Yuka and Noe. After their beautiful performance, the St Rita’s School Anthem and Waltzing Matilda were sung by the St Rita’s girls. 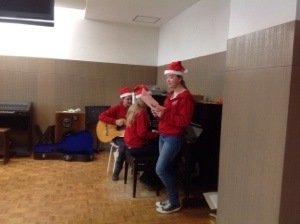 This was followed by a Japanese Dance Performance by Aoi and several songs from the Atomi Gakuen girls and their teacher, including “Castle in the Sky” from popular anime Laputa, Edelweiss and the Atomi Gakuen School Song. 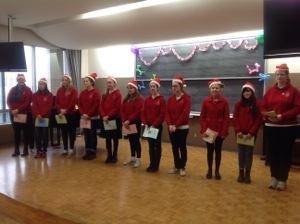 After these performances, Emma, Abby, Georgia-Rose and Olivia presented a short speech and we all formally thanked our host families. 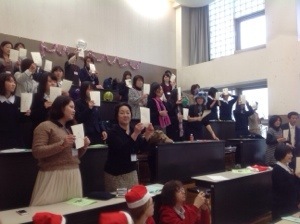 The concluded the party by singing Jingle Bells and taking photos. 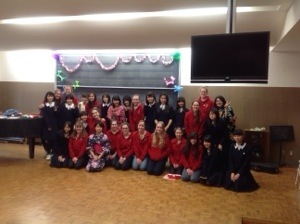 The farewell ceremony was a wonderful success and I’m sure we will all miss our host families. Upon arriving home, my host family and I began celebrating my host sister’s 12th birthday. We ate sweets together, bought a cake, took Japanese photos together and ate a delicious dinner. We now prepare for the exciting journey home tomorrow, but I’m sure we’ll never forget the wonderful experiences and people we have met here in Japan. 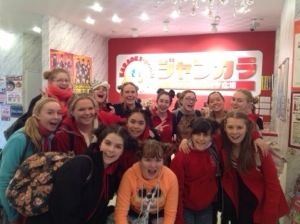 As the St Rita’s Japan Tour 2013 comes to an end, our last day was filled with enjoyment and memories which will last a life time. 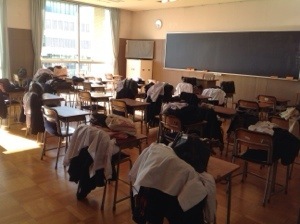 Our day began by arriving at Atomi Gakuen to make some quick purchases from the school’s uniform shop, before heading to the music room. 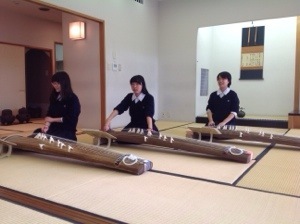 Atomi students Aoi, Yuka, Kana and Noe performed the traditional instrument, Koto, as well as all girls performing the songs Castle in the Sky and their Atomi Gakuen school anthem. It was an interesting and cultural experience! Posted in Info, Japan Trip 2013. Today I woke up to an amazing breakfast in the Kunihara household. Unfortunately otousan (father) was not present as he had work first thing in the morning, so I enjoyed breakfast with Rumi and her mother, Momiko. Rumi and I quickly got dressed and headed out for the day with Miako (Rumi`s best friend) and Midori (my old host sister) to Harajuku. We did some shopping and a lot of eating, and I even experienced eating ramen for the first time. It was great! During the day we travelled a lot by train and explored alot of Tokyo city. It was an amazing day and I enjoyed it. 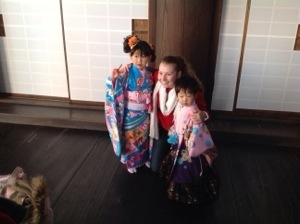 I must say the homestay is one of the best experiences of my life! 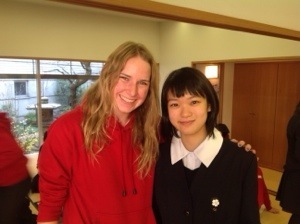 My host family (Miyazaki Family) are so nice and take care of me like I was a child of their own. When I first arrived I was taken to a mouthwatering steak bar where I ate to my hearts content. We later arrived back at my host family’s apartment (on the 22nd floor) which had panoramic views of Tokyo city and the famous Tokyo Sky Tree which I later found out that my host dad helped build. I spent the next day exploring the ins and outs of Harajuku and then caught a train to Ikebukuro where my host sister and I dressed in cosplay and took special photos called Puri – Kura. My host mother then surprised us with a variety of sweets from the convenience store down the road which we ate quickly. The next day we spent most of the day driving along the Japanese coast line, visiting places such as Yokohama where we visited Cosmo land and rode a roller coaster that went underwater!! I’m having the time of my life and I don’t want it to end!! Some more adventures from the girls’ homestay experiences…..
After a peaceful night’s sleep, I woke up ready to embark on the activities planned for my first day with the Muroya Family. The day began with breakfast, where my host sister Kana and her family tried vegemite for the first time… It wasn’t very popular! After getting dressed, Kana and I walked to the station where we caught two subways to arrive at Laqua Shopping Centre. 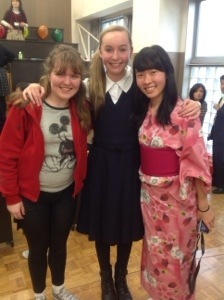 Here, I met two of Kana’s friends: Rina and Ritsuko, who were lovely and both very good at English! Attached to the shopping centre was an amusement park containing various rides. However, they all looked too scary for me! 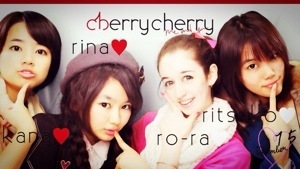 To begin, we took purikura, which is a Japanese photo booth, very popular for high school girls! We looked in numerous shops, all of which Kana and her friends shop in all the time. Following our shopping adventures, we went to an Italian restaurant for lunch where we ate a salad and pasta, which was delicious. 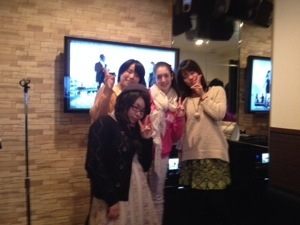 Next on the agenda was Karaoke! An afternoon filled with Justin Bieber and Lady Gaga, along with famous Japanese artists such as Karipyamupyamu and AKB48. We screamed, danced and had lots of fun, but it was time to say goodbye to Kana’s friends as we all headed in our separate directions to go home. Once we arrived home, Kana and I looked at our purchases, although my pile was significantly larger than hers, before going out to dinner at a restaurant where we ate Yakiniku, a traditional Japanese meal. It was very delicious! After a long day, we returned to Kana’s apartment to go to bed to get a long nights rest before arising to embark on the adventures planned for tomorrow. Today was the first official day of spending time with our host family. I’m sure that everyone is having a wonderful time with their families as they love to spoil us with everything we could possibly ask for. For me, today was a very busy day that involved a lot of walking and shopping. Firstly, my host sister, Hina, and I went to Shibuya to do some shopping. There is so much to do in the massive 8 floored building, there was barely enough time in the 2 hours we spent there to see it all. It would be near impossible to be bored in this department store which is abundant in clothes, shoes, cosmetics and accessory stores. I’m sure that no one could walk away without buying something! Next, my host mother, sister and I went to lunch in Ebisu to meet with my host sister’s grandmother. We ate self-grilled marinated beef and a variety of other side dishes including rice, kimchi, salad and miso soup. Hina’s grandmother, like many other Japanese people, is so incredibly welcoming even though we may not have been able to fully understand each other. Even if it’s just simple hand gestures, people will definitely try to converse with you. Lastly, we went to Tokyo Sky Tree and surrounding shops, including a Studio Ghibli one. Tokyo Sky Tree is absolutely incredible. The sheer height of it made my neck sore. 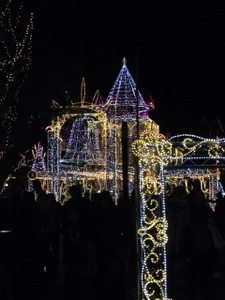 It also began to light up as a small concert was held just outside. On the whole, my day was fantastic. Everyone here has been so welcoming, kind, and polite. I hope to enjoy another busy yet fun day tomorrow! We woke up bright and early today, ready to meet our host families. We were excited but nervous at the same time. After breakfast, we then carried our luggage down the stairs and walked to the train station. 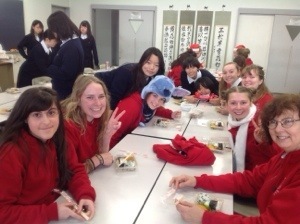 We arrived at the Myogadani station and walked a short distance to Atomi High school. Many students were waiting for us outside the school. They were all excited and gave us hugs. 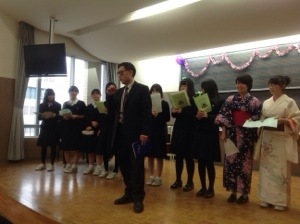 The students introduced their school to us, showing us many classrooms such as music, PE, english and biology. In chemistry class, the teacher experimented with alkali metals which burn brightly in water. Also, in art class, the students were making plates out of clay. 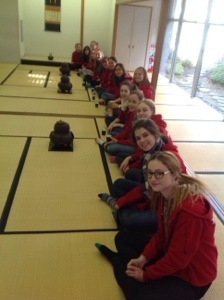 After the tour, we all met at a Japanese style room (tatami mat flooring) where the welcome ceremony was held. 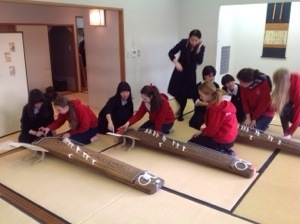 They performed Japanese tea ceremony and played Japanese harps. We got to try out the harp and it was really hard to play. After the welcome ceremony, we went home with our host families. My first meal was Japanese noodles called Udon. It was delicious. While I was enjoying the meal, there was an earthquake! I didn’t panic because it was only a small one but I was quite surprised at how my host family just kept eating their meal. Later, I went shopping at the local super market near the homestay. My host family introduced me to many traditional sweets and famous local products. In the afternoon, I learned origami with my host sister. Dinner was roasted beef and baked vegetable. Yum! I had a great day today. You could almost feel waves of anticipation and nervous excitement in the air, today we would leave the comfort of our English speaking friends and start our own Japanese cultural experience as it was the first day of home stay. We were packed and ready to depart the youth hostel that had been our home for the past 4 days at 8:45am. 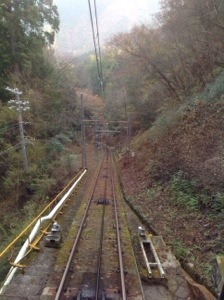 The journey to Atomi Gakuen school was very trying and tiring. With our bags in tow we had to navigate the labyrinth that was the train stations. Stairs proved to be a challenge. 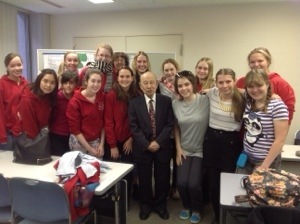 However, all our bag troubles were forgotten as soon as we saw the welcoming faces of the Atomi Gakuen students. They willingly showed us around their beautiful school. We even got to meet some of the teachers! 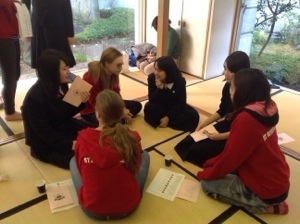 They further introduced us to the Japanese culture with a tea ceremony and koto playing. It was all extremely interesting. Finally it was time to go to our new homes. Personally, my host family was very welcoming. They have given me lots of presents which I’m worried won’t fit in my bag. Sometimes it is a bit hard to communicate. I have definitely been using a lot of actions. But the experience has so far been very enjoyable. I’m very excited about the next few days, they seem to have a lot of fun stuff planned for me. Hello everyone. 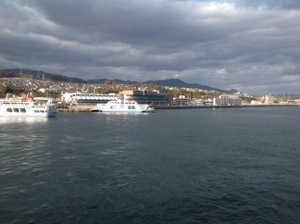 Over the past two days, we have enjoyed spending time in Hiroshima. We started our morning early on day 6, catching a train to Hiroshima, which took approximately 3 hours. Once we got there we partook in a lunch at the A-bomb museum. After lunch we took a tram to a ferry, which took us to Miyajima Island. We saw majority of the island whilst on the ferry. 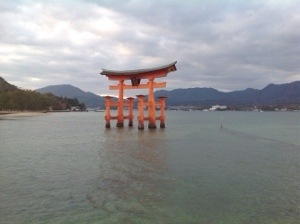 We saw the shrine gate, which stands in the ocean. 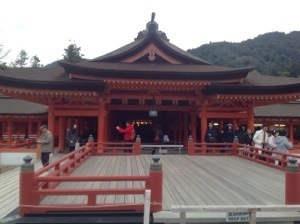 We explored the Shinto shrine and learnt about the history of the island and the surrounding areas. Throughout the island roam the sacred deer which were not as tame as the ones at Nara. We were then able to shop and proceed to the ryokan (traditional Japanese inn). At the ryokan, we enjoyed a lovely dinner, prepared by the owners. After dinner we were met with a surprise, which turned out to be an array of Christmas lights lining the main streets of Hiroshima. There were 12 exhibitions ranging from sweets to princess castles and whale boats. We were in awe! We begun our morning with an enjoyable breakfast in the ryokan, after which we travelled to Shukkei-en gardens. They were monumentally picturesque! 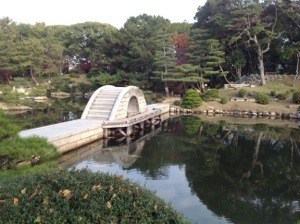 Based on the beautiful Japanese nature, they featured islets and bridges which had survived the A-bomb. 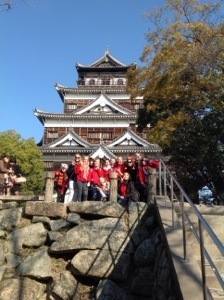 We then took a tram to Hiroshima castle, which was astoundingly breathtaking! Despite its age the castle remains in tact, and is able to be enjoyed by tourists. 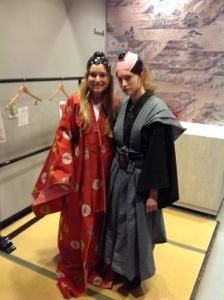 We were able to dress up as Geishas and Samurais from many years long passed. 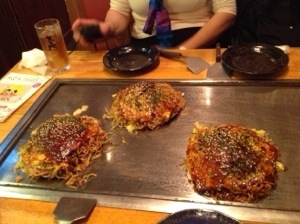 We then had lunch in a department store which housed the very famous Hiroshima pancakes – okonomiyaki! Consisting of cabbage, noodles, egg, and special sauce, the meal was delicious! From there we journeyed to the A-bomb park where we enjoyed the museum and heard the heart-wrenching story of an A-bomb survivor. After we said goodbye to our tour guide, we traversed the numerous shops. Many of us grabbed various snacks in preparation for the train ride tomorrow. 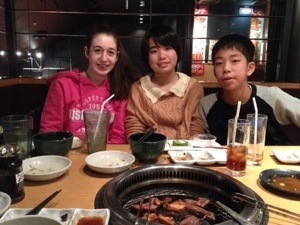 We then enjoyed dinner at the hotel, after which, some of us chose to indulge in the onsen. We went to bed early in order to happily get up bright and early tomorrow. Minnasan konnichiwa (hello everyone). 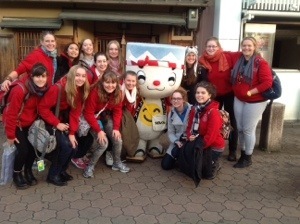 Today we had an early wake up for a day trip to Nara!! We saw deers everywhere (so cute) which were really tame. The deers even crossed the pedestrian crossing. We all bought lots of biscuits, which were 150 yen, to feed the deers. As soon as we bought the biscuits, the deers ran towards us and ate from our hands. Even when all the biscuits were gone, the deers continued to follow us all the way back to the temple. 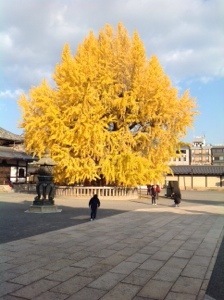 The temple we visited is the biggest wooden structure in the world, with the dimensions of 57.01m x 50.48m x 48.74m. It was made in the 8th century and was reserved as a place of prayer for peace and affluence on earth. 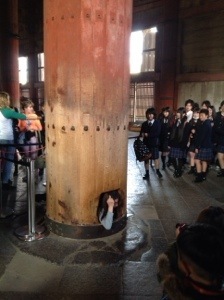 There was a huge daibutsu (a big Buddha) and some of us crawled through a hole the size of the daibutsu’s nostril. Once we exited the temple, the deers were still waiting there to greet us. But, we were all very hungry so we began the long trek to the restaurant. The food was delicious. We we able to cook our own chicken and pork in teriyaki sauce and we ate it with rice and tempura. YUM!! 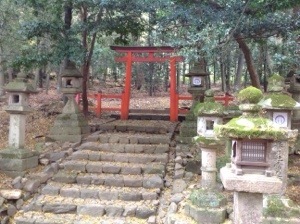 We, also, visited the old style shrine of Shintoism dedicated to the worship of nature. Here, if we wanted to, we could write a wish for love. We went to Gion Corner where we watched the traditional arts of Kyoto: tea ceremony, Japanese harp, flower arrangement, court music, ancient comic play and Kyoto style dance. 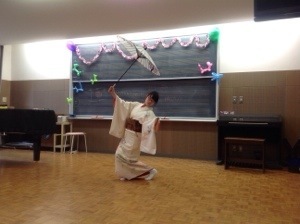 Mameroku, who performed the Kyoto style dance, was stunning. After the performance ended, we all took pictures with her. This morning, we awoke at 6am to the sound of a gong and attended this morning’s service with the monks. This service involved observing the monks’ chanting and an address from the Head Priest of the Buddhist temple. 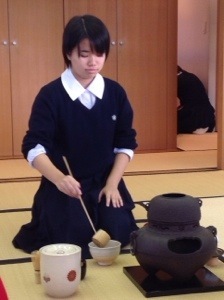 After this service, we were sent to a vegetarian breakfast of rice, seaweed, soybeans, tofu and mizu soup. 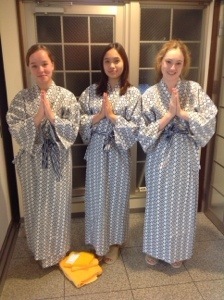 We packed our bags, said our goodbyes to the monks and were on our way back to Koyasan Station. 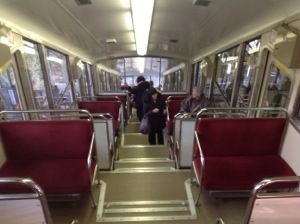 We boarded a bus, cable car, train and shinkansen as we travelled from Osaka to Kyoto. Upon our arrival at Kyoto Station, we were lead to the Kyoto Tokyu Hotel, to deliver our overnight bags and then we were off to lunch. For lunch, we were served a semi-traditional Japanese meal of fried chicken, egg and rice, and salad. 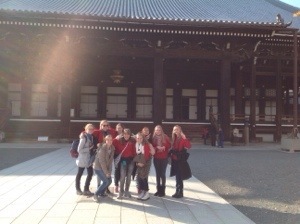 After we finished our meal, we headed to the temple across the street, the Higashihonganji Temple. 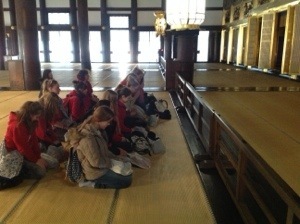 At the Higashihonganji Temple, we were shown the temple and the main hall. 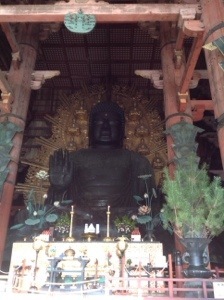 In the main hall, we were able to view another set of monks chanting and everyone was very interested in the young children dressed in kimonos. 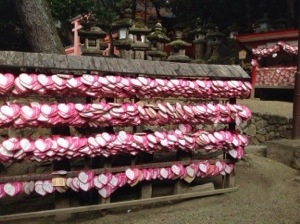 (When children are aged 3, 5 and 7, they are taken to the temples, traditionally dressed). Once we had finished exploring the temple, we decided to travel to the Gion district to do some sightseeing and shopping. 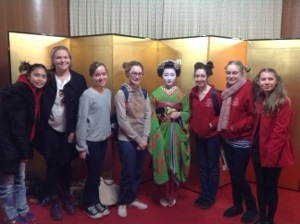 In the Gion district, we were taught about the Geiko (also known as Geishas) and the Maiko (girls training to be Geiko). They are taught dancing, singing and to play instruments, as well as traditional ceremonies and arts, for their roles as entertainers. We also met Udon-kun, a character representing the Udon museum. Before we headed to dinner, we spent an hour shopping. For dinner, we went to a restaurant in which you are provided with batter, crumbs and oil, which are used to deep-fry your food. You had a choice to fry your main meal, mainly consisting of vegetables and meat, or some of us attempted to deep-fry our desserts, featuring petite hot cakes, petite choux cream buns and marshmallows. Once we concluded our exciting meal, we headed back to the hotel via bus and settled in for the night. We are eagerly awaiting our adventures tomorrow when we visit Kyoto’s temples.